To the left: Man's Fate, altered book about extinction. I started a new altered book the other day. In fact, I started two of them, but this only meant that I set a course of action and then removed about half the pages from both volumes. I also conducted a few "test" examples for the one. After a trip to City Art for more watercolors and inks, I began in earnest.The one I started is called "Mosaic". That's actually the title. I bought this perfectly fine hardback novel at the Book Dispensary for $2. I looked the title up on the Amazon website and found used editions selling for as low as a penny (plus shipping and handling!) The reviews weren't particularly good either. Thus, I really don't feel horrible about destroying the pristine condition of the book! I bought it for it's title, of course. What could be more perfect for the archeology show than a book titled for Janet's medium? My plan was to illustrate the word "mosaic" in a new manner. I haven't written a formal statement yet, of course; but the idea is this: Words, even letters, are like the tessera of a mosaic. Alone the tessera are just pieces, tiles. Only when put together is there an image, a mosaic. A book is like a mosaic. By focusing on just a few words, randomly selected, one sees the "tessera".To this end, I am using crayons to highlight various words. Then, I am covering the remaining words with black watercolor. I've found an ink that is fairly opaque. I'm adding some other iridescent colors around the edges and also leaving a word or two totally uncolored. The pages look strangely pretty. There is a sense of a greater text, sentences, a story; but the focus is on just a few individual words. It is going well. On Tuesday evening Steve and I went out to Bill Mishoe's Tuesday night "junk" sale. It was lots of fun. We haven't been to an auction in a long, long time but used to go regularly. We really loved just shifting through the stuff of other lives. Where else could one find antique molds for artifical teeth and tacky Christmas ornaments all on the same evening! I left two bids on two table lots of yarn, but I wasn't the successful bidder. Other than the time I spent watching Ohio State football, I spent the weekend in my studio. The bird book (Man's Fate) is done. I photographed all 43 "spreads". (Spread is still a "new" word to me! It refers to two pages of a book, one beside another as if SPREAD open on a table! I had problems with the digital camera. I think it is DYING! I get "corroded data" messages and the camera ceases to operate after about ten or so images. I fought with it until I managed to download all the pictures I needed. Then, I contrast and color corrected each, wrote a statement, and handed the project off to Alex. He's making another mini-video of the book. He even found the perfect music. The mood is slightly haunting. The melody and tempo are pleasant. The instruments give it a multi-cultural feeling. 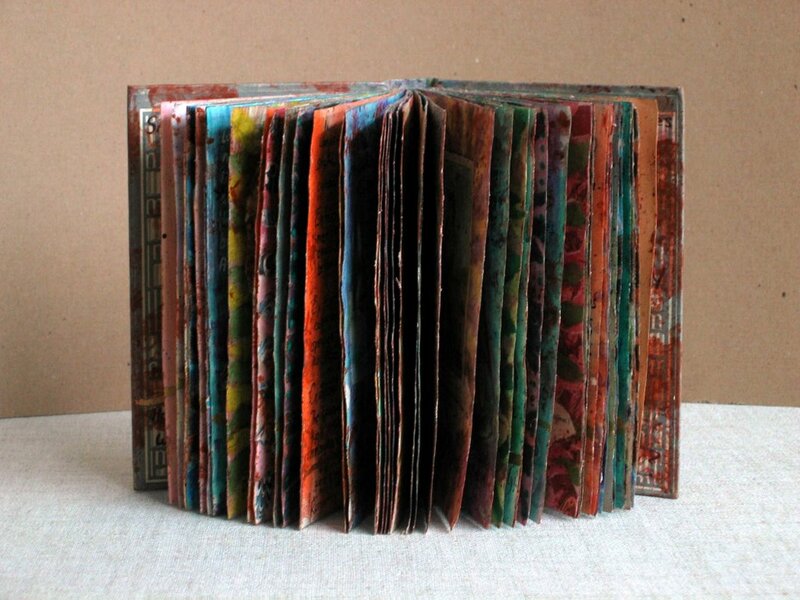 This altered book was created using André Malraux’s 1934 novel Man’s Fate. It is a reflection on the destiny of mankind, asking timeless questions about our culture. Will we endure? Is our future predetermined or unfolding by chance? Seeingly bloodied pages turn over a gilded timeline, passing “Bird Lotto” playing cards from a 1928 children’s board game. Issues of extinction mingle with reminders of lost civilizations. 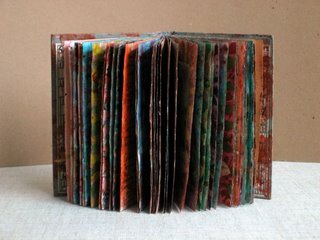 This altered book will be part of a larger installation of artistic relics of an imagined past civilization. The exhibition, “Stone, Bone and Fiber: Excavating Lost Civilizations of the Mind”, will be on view for the month of January 2007 at I. Pinckney Simons Gallery, 1012 Gervais Street, Columbia, SC. It will feature the work of Susan Lenz and Janet Kozachek. A reception with both artists is scheduled on January 18 from 5:30 to 8 PM. Yesterday, Monday, I dropped off my entries for the State Fair and entered another juried show: Craftforms 2006. There was a Vista Studios meeting at noon. I didn't go. I've finally quit as that group's secretary. Hank Fuseler's reception was small but nice. His parents are easily the best part of the evening. They are delightful and totally supportive of their son's art. Hank has no formal art training. He really only started producing work six or so years ago, about the time I started creating work (also without university training!) Hank has been in a few local shows and a few in Asheville. He moved there a year ago. He's mounted four solo exhibitions at Gallery 80808, so I've had the opportunity to see his work evolve. His first three show sold wildly. Almost everything hanging sported a red dot. His work was different, small, crusty, and quite affordable (average price $150). Most of his pieces were textural and painted (better pieces) and just a few had photographic transfers (not as successful). This time, most of the work had transfers and the painting style changed drastically. His work is much more minimal. He included digital prints. His average price is now about $250. Only two pieces sold. His brother's three-person band played for the reception. They were excellent. His dad showed me images still stored in his camera of a show in Tryon, NC in which Hank took part. Steve came to the show and we looked at all the work together. It's always hilarious to go to an art opening with Steve, especially when the work is significantly abstracted or non-objective or in a minimalist vain. Steve hates all of it but does his best to be polite. It is fun to listen to him try and say complimentary words without actually referring to the work! We had a nice conversation with Jeff Donovan and Marcelo Novo though. Personally, I think Hank's work is pretty interesting. I like seeing the changes over time. Price did affect the speed at which his earlier work sold but I think they would still have been purchased for more money. The new work, however, requires a particular buyer, someone who appreciates subtly. What I liked best was the colors. Too many young artists use dark colors in order to appear serious. Hank's palette is much brighter, whiter, and pleasant. Little by little, I've gotten back into the swing of my own creativity throughout the week. My "bird" book is nearly complete. Several more fabric artifacts for the archeology project have been beaded. I am ready to free motion stitch into the three "Elements of Architecture" pieces I hand stitched while in England (and on the plane and in the trains, etc!) The purchases I made at the Knitting and Stitching show seem to be calling to me, urging me to use them. First, however, I had to collect my thoughts about the trade show. I read through the notes I took, wrote a few impressions as Word Documents, and sorted through the books I bought. Then, I was determined to fight with my computer and the Internet until photos could be uploaded and blogging posts could submitted. For the past two days, I've also been finishing up other dreaded paperwork. The application for the South Carolina Arts Commission's annual fellowship awards is due on October 1. I decided to submit ten slides from my African Series. The on-line application took more time than I thought it would (as normal). It meant I had to update my resume and give a title to my solo show slated for November at USC-Aiken. I'm calling it "Masks and Markings". All the slides had to be put into new mounts because only the last six digits of one's social security number is permitted to be seen by the out-of-state jurors. I filled out everything perfectly, double-checking every blank and box--as if I stand a chance at being named! It's funny how nervous I can get at doing something that I know isn't going to make a difference! Then, as if I needed more useless paperwork, I figured out how to get 300 dpi images that weren't more than 700 pixels in the longest direction into a portfolio at Juried Art Services. This is all part of my application for the Smithsonian Craft Show at the Building Museum in Washington, DC. I couldn't have managed without Sharon Licata. She scanned all my slides and helped me figure out how to get the images to stay at 300 dpi instead of being converted by some default setting to a mere 72! I submitted the required five images of my vessels. Each had to have dimensions, a description, a title, a price, and then be put onto a single page in an order of my selection. It really wasn't that difficult; but, like all paperwork, it took much longer than I had anticipated. Amazingly, the Visa number flew quickly through for payment! So, now I've applied along with approximately 1,200 fine craftsmen from all over the USA for the 120 spots available. Tonight is Hank Fuseler's who opening at Vista Studios. I need to get into the studio again and really spend dozens of hours elbow deep in artwork--if for no better reason than to get the futility of paperwork completely out of my system. Above: I found these images on line. One is a sketchbook and the other an embroidery. I have no idea to which of the Caprara's these works belong. I guess it doesn't matter! All the sketchbooks I saw amazed me. The stitching, likely Julia's, captivates me. I am itching to finish writing about the Knitting and Stitching show in Birmingham, not that it wasn't fantastic; it was outstanding! I'm just ready to focus on my own work and creativity. Still, writing about the experience does provide a moment of reflection and also an on-line place to which I can return for future inspiration. So, here are some other things I saw in England! 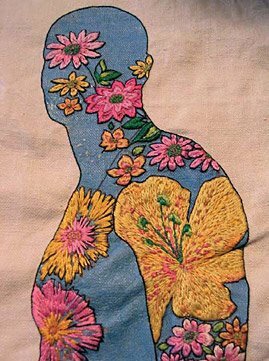 Hilary Hollingworth had a great booth of her figurative embroideries. The images were impressionistic, soft, and presented well. I especially liked the grounds she selected. Some seemed to be created on a dense fabric, like a linen twill, and others were on natural felts. The reason I spent time with these pieces, however, was the unique stitching. Hilary weaves her threads. I've always thought of needle make weaving as "lacy" and "regular" and quite orderly. This wasn't the case at all. The weaving seemed in patches that related to the figures that were portraying. Symmetry and even spacing was unimportant. I have generally never used needle weaving and will have to add this approach to my own work! Her prices were quite reasonable too! Jae Maries' exhibit was across the aisle from Paddy Killer's space. She, too, relied on a strong ability to draw. The work was completely different. After creating a sketch (to scale) Jae used all sorts of paints and fabric snippets and strips to recreate the image. The ground was often muslin or even denim. There was a great urban feeling to each piece. Margaret Beal demonstrated her soldering techniques and had her recent book available as well as some supplies. Frankly, I thought she was a little snooty. She gave me the impression that she only wanted to show how process to those seriously considering making a purchase. Jean Draper, however, didn't seem to even want to talk to me at all. I really got the impression that her area was for "serious textile collectors" only. Maggie Grey, however, was a burst of sunshine and happiness. Swished into a tiny space, she just radiated happiness while eagerly sharing her dissolvable paper techniques. She had sample packages and her books available but made casual references to selling, as if it were far less important than communicating with her constant audience. As a result, there were always people infront of her and her wares sold very, very well. I bought two of the hardback books, one co-authored with Valerie Campbell-Harding. I didn't purchase the supplies from her but bought a larger quantity from another vendor she said carried the dissolvable paper alone. I've leafed through the books; they are first-rate! Above I posted the on-line address that Barbara Lee Smith hand wrote for me. I haven't tried it yet but plan on visiting this site because there are LOTS of other videos about prominent textile artists. In fact, there are 42 available and three in production, including Barbara Lee Smith's. 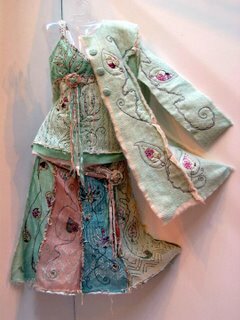 Interestingly, the other two in production are Jan Beaney and Jean Littlejohn, the two British fiber artists who have inspired and taught me the most! Finally, I have to talk a bit about the exhibit of Julia and Alex Caprara's work. I've heard about this British couple, their embroidery school (Opus), the sketch books, and the working vacations to exotic locations they've taken with Jan Beaney and Jean Littlejohn. This was the first time, however, that I had an opportunity to actually SEE their work. I was drawn in and repelled all at once. I found so much to love and yet wasn't blown away. How can I say this correctly? How can I explain my appreciation mixed with the realization that I can produce work of equal quality? I'm just too close to the subject and not a good enough writer to do my thoughts any justice! I read the statement about Julia Caprara's work. 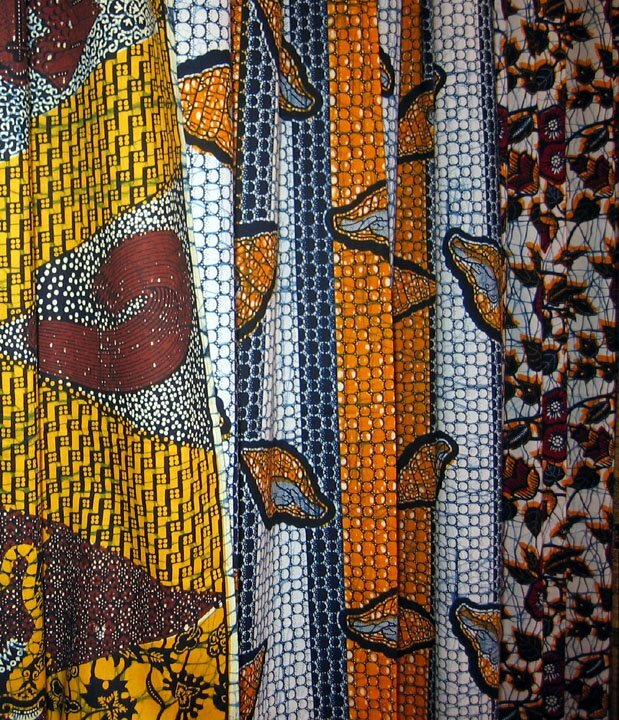 It talked about her preoccupation with color and symbol and the way that stitched textiles link the world's cultures and people together, throughout history. It talked about transformation. 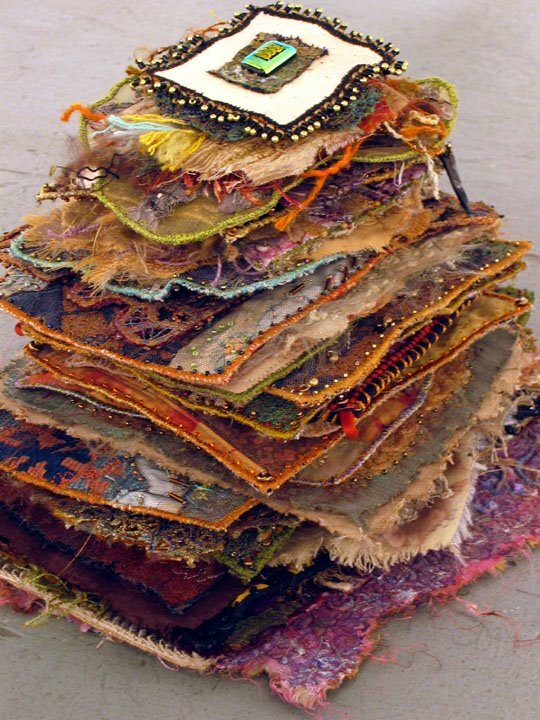 For Julia Caprara, transformation is the way combinations of unexpected elements and raw materials of everyday life (color, thread, wood, stone, found objects) become empowered like a visual metaphor or talisman. These combinations create a "symbol". That symbol is linked to the creative unconscious. I like all these words. I relate to these ideas. It all sounds very much like the statements I try to write in explanation of my work. Basically, it sounds like the creative unconscious is alive and well and creating work. Later, the conscious writes rather vague sentences linking the work to just about everything, cultures and history and colors and textures that appeal in the process. If the Caprara's can do this, why can't I. I suppose all the words are true for them. I suppose they are equally true for me. Then, I looked at all the work. I really do like the pieces. I liked the titles even more. There is a series of "divination wands", some are for nourishment and some for other abstract nouns. Most of the wands were bamboo poles or odd pieces of driftwood. To these were applied layers of sheers fused together and sporting a few soldered markings. Metallic foil had been added. Segments of fishing rods, neon monofilament, beads, and small found objects were also attached. Mythology plays a role in the titles, like "Rune Cloth" and "Divination Wand for ...name of a god or goddess". Other titles I liked were: Life Maps, Transformation Cloth, Second Skin, and Power Stitches The textile hangings are crudely stitched with great beauty. They are hardly flat. Edges are nicely raveled. There is a sense of primitive lifestyles and magical people. Still, I got the impression that stitching was the most important thing. How or what one stitched could be explained later, so long as the activity was all consuming. In this vein, all the work was outstanding. The pieces, however, that inspired my most were undoubtedly the sketchbooks. Spiral bound watercolor paper were used. The pages were torn to reveal several parts of the pages undernearth. The tearing related to the drawings of coastal stones, water, and scenary. The layering of the pages added to the dizzing display of color. Crayons were used as a resist. Thus, the sketches didn't require a high level of skill in draftsmanship (which I know Alex Caprara possesses!) 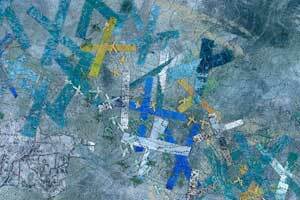 These were the quick markings that captured the essence of a place, the color and fell of a particular location. They were done on site and had plenty of life due to this approach. These sketchbooks certainly required the artist to really look at a vista and relate to it. I was quite impressed. The image at the top of the screen does no justice to the experience of looking at one of these sketchbooks in person! The image at the top of the screen of the embroidery is far more dense and textural appealing than any of the work most recently on display, too. 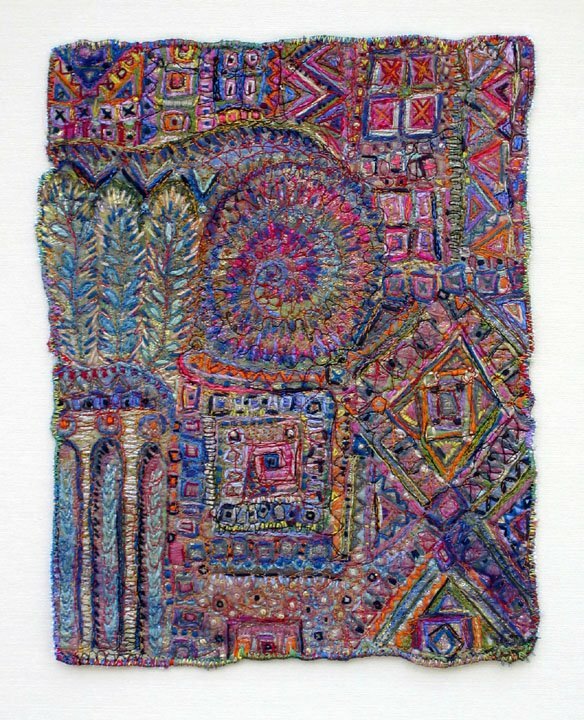 I have a feeling that Julia and Alex Caprara are so prolific that one ought not make any final decisions on their work until much more of it is seen than was available at the Knitting and Stitching Show! Well, for some unknow reason, uploading images became easy to do this morning! Almost instantly, the pictures popped up in the composition screen. So, now I can continue writing about some of the great things I saw in Birmingham last weekend. Above, left: A selection of batiks on display in a booth of International Batik artists. 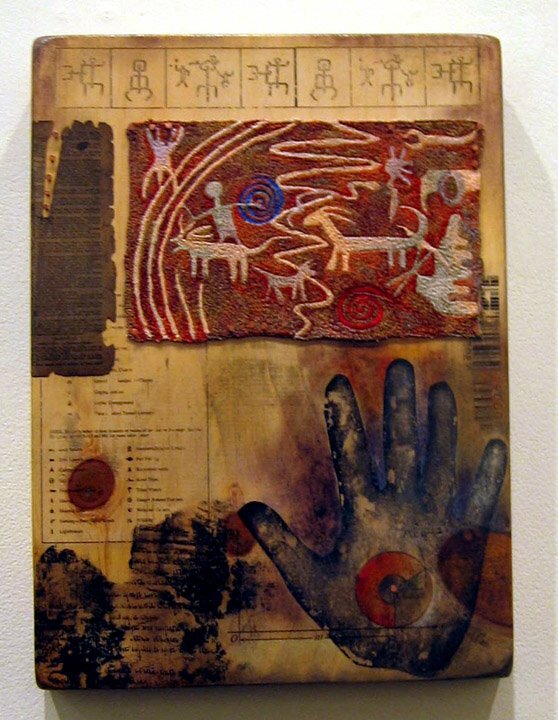 Above, right: James Hunting's Tattooed Man embroidery. James was one of the few males in the entire trade show. His biography included years in the fashion industry, teaching in the universities, and a strong desire to stitch with passion. He is only five years younger than am I and recently returned to earn an advanced degree in Textiles. His skill in figurative drawing was apparent in all his work. He was quite pleasant in conversations and had the guts to include homosexual poses and male nudes. These were all quite beautifully done and were displayed with rightful pride. Mathias and I were both impressed. Yesterday I posted a single picture. It was an incredible outfit created by Angelique Ward, a graduate and award winner of the knitting textile courses. I wanted to continue but couldn't upload any of these shots, so now I'll continue! This detail shot is part of a unique creation of knitted "rags" and strips of burlap and cotton by Aber Nasher. It is called "Body". The statement was great. Aber was influenced by bones and movement and believes that one's body outght to control a garment instead of the other way around. I couldn't agree more, though I don't think the outfit was one I'd wear with this notion in mind! In fact, the knots might hinder sitting or wearing a coat and would likely catch on things one would pass while walking. 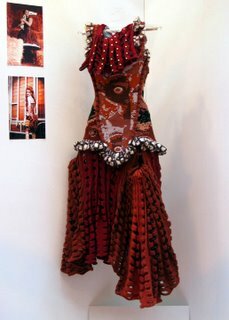 Still, the texture was most wonderful and the garment would certainly take viewer's eyes off of the wearer's body type! It definitely looked comfortable! 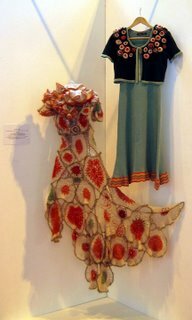 The photo to the left is of two outfits by Pamela Leung. The display was called "Sushi" for obvious reasons. It was a clever way of using knitting for artistic interpretation. What I likely best about this idea was how wearable and functional the garments were while still being totally obvious about the source of inspiration. 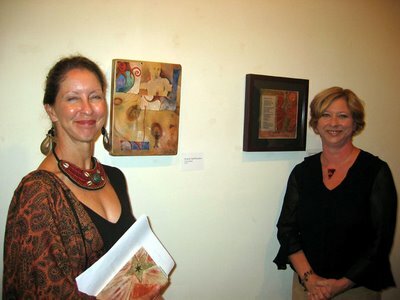 To the right is Maggi Rowell's "Nurturing Mother's Angst" and "Molly Coddle". To me, this was the most artistic of the selections. Both pieces weren't meant to function as garments at all but as artistic statements. They attracted much attention. It was fun to watch the reaction on the faces of the many elderly, very conservative ladies as they wandered through this exhibition! I very much liked Jo Knell's "Apocaphypse Tartan", though I have to admit I just didn't get the reference to a tartan! Of course, I'm not Scottish and have no true understanding of what a tartan is or can be skewed into! The dress, however, was absolutely great. The statement talked about the inspiration coming from recent news about the bird flu. Ideas about the end of the world also figured into the garment that was meant to clad rock stars. This worked. The bird details were there, especially in the photos of a model wearing the piece. The outfit was created with skill and the result looked fun to wear. I would don it for any art opening myself! I'm having loads of problems getting any image to load at this point. I'm frustrated and left wondering whether or not I can even post words. I guess I'll find out in a minute. 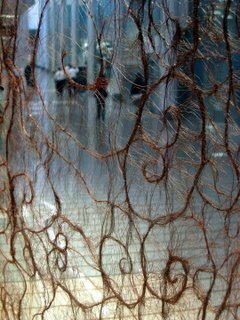 I have no images of Barbara Lee Smith's solo exhibition at the Knitting and Stitching Show in Birmingham, England. Photography in that area, like most of the artistic display spaces, was prohibited. It is understandable. I saw several people, however, snapping a few illegal shots using their cell phones! I resisted the urge. Instead, I sat in one of two provided folding chairs and watched the video of Barbara Lee Smith making her various series of wall hanging textiles. She uses a medium-weight Lutrador, a fabric made in North Carolina generally for the upholstery business. It looks like an interfacing material. It is strong, nearly impossible to rip, thus it doesn't distort at all and is very durable. Barbara Lee Smith paints the white surface using watered down acrylic paints. She sprays the paint from a plastic bottle. Acrylic gesso is used sparsely as a resist. Her palette is quite pastel, even a bit grayed. WonderUnder is ironed on to the back of the painted pieces intended for collage. The large pieces she selects as a "painting" or base for collage is also backed with WonderUnder and approximately two more layers of plain Lutrador. This provides a nice, thicker substrata on which she can work. She uses a soldering iron to deckle the edges. Then, she cuts from the large stock of painted Lutrador for collaging. Some have transfers on them, but the video never mentioned the process used. The images she creates are nearly abstractions but would really be closer to impressionism. Water is a big influence, so are leaves and sky. Repeated motifs include two thin strips of Lutrador ironed down in a cross formation. Once she has completed the collaging, she machine embroiders the piece, mostly from the reverse. She calls the free motion work a "drawing". It really is. Unlike me, she is very, very precise in her speed of execution and her ability not to cross over her own lines. As a result, her stitching very much resembles a contour map. She also includes four panels down the side of her seascapes. These are part of the more abstracted work. Sheviews these small rectangular pieces as if "keys" on a map. Some of the work has a few hand stitches. Some even have mercator lines. The overall effect is most pleasant, in fact, very soothing to look at. This was one of the areas in which Mathias and I spent more time. I had already watched the video on Friday morning, so on Sunday Mathias and I just looked. There really weren't very many men at this trade show, a few elderly husbands carrying their wives' purchases and two male textile students stitching. Thus, Barbara Lee seemed to notice us. She introduced herself and immediately heard our accents from the States. A conversation quickly started. This was the most charming part of the day. It seems that Barbara Lee Smith used to live in Chicago and regularly attended performances by Hubbard Street Dance Theater and Alvin Ailey! Now that she lives in Washington State, we sees Pacific Northwest. In college she'd seen Merce Cunningham. Mathias and Barbara talked dance for several minutes. Both seemed impressed with one another. Maybe I should be said that Mathias was the only US male to have won a medal in the Moscow International Ballet Competition. Maybe I should have bragged about his recent gold in Varna. I didn't. It really didn't need to be done; besides, I really couldn't hold my own in the conversation! Barbara Lee Smith is worth looking up on-line. 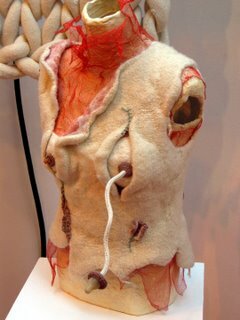 Of course, the Knitting and Stitching Show has examples of her work and statements at www.twistedthread.com/knittingandstitchingshow/features.asp. Another website that deals with the current body of work is: http://textilegallery.unl.edu/archives/2005/smithpage. Most of the Knitting and Stitching Show in Birmingham was dedicated to vendor booths set up in long aisles. The array of merchandise went from handspun and hand-dyed wools to glitter by the scoopful. I was overwhelmed by the beautiful and entertained by the tacky. Another area of the trade show was mainly exhibition related. Larger spaces showed examples from an international batik group, various fiber artists selling their work, and a focal display of Barbara Lee Smith's recent wall hanging pieces called "Mapping the Mysteries". I will write about many of these areas individually. I will try to post some photos; but, like normal, I'm having problems getting the images onto the posting screen. Currently, I've managed just this one: Angelique Ward's Arts and Crafts inspired attire. 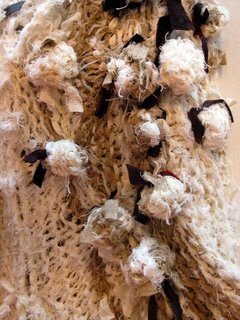 It was part of the Knitted Textile Student Awards. This was one of the few artistic areas permitting photography. I have other images and will try to post them later. I found the graduate student work quite amazing. Each was presented with a title, a statement, and generally a few photos of the garment on a model. Well, once again, I can't seem to manage to upload images when I want but am able to do it later. 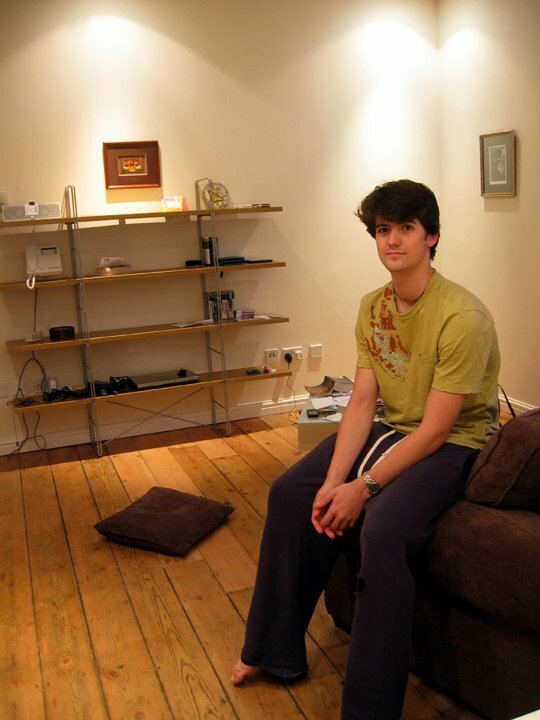 So, here are the photos of Mathias and his new flat! So many people had said that Birmingham isn’t a pretty city. They’ve talked of the industrialization, the seedy side of town, the ugly worker’s quarters, smelly docks, rusty freight areas, and pollution. They’ve compared it unfavorably to London. It sounded cold, damp, hard, and rather Spartan. It sounded unsightly. I did not find any of these descriptions accurate at all. Sure, I never ventured into the outskirts of town where there might be tenement styled housing surrounded by smelling trash bins. I never went to the import/export stations or to any of the industrial centers. I passed a few on the train, but even these areas weren’t covered in random graffiti or overgrown with weeds, barb-wire fencing, or junk piles. Surely this exists, but I didn’t see it. Mathias certainly has no reason to go looking for the under-belly of Birmingham either. Instead, I found a busy city full of beautiful buildings and lots of activity. The downtown area is a pedestrian zone. The shops are nice. It is clean and well policed. There are regal churches, interesting arcades, an outdoor fruit and vegetable market, a permanently covered household market, dozens of malls, theaters, restaurants for every type of cuisine, upscale bars, hundreds of taxis, and a well marked public transportation system. The civic structures are beautiful. The art museum was quite nice. The squares were vast and well maintained. I really liked the place. Mathias lives in an area called the Jewelry Quarter. It is exactly where I would live if I were there. Growth and refurbishing is obvious everywhere. Many of the buildings have recently been turned into apartments for professionals. Many buildings have “For Sale” signs covered over with the word “SOLD”. It is quiet and near downtown. The walk to the Birmingham Royal Ballet is about fifteen minutes. Many of the other dancers live in this section of town. Sometimes, Mathias and a few new buddies share a cab ride after class and rehearsal. There’s a little market nearby that stays open fairly late. Signs advertise for artist’s studios. 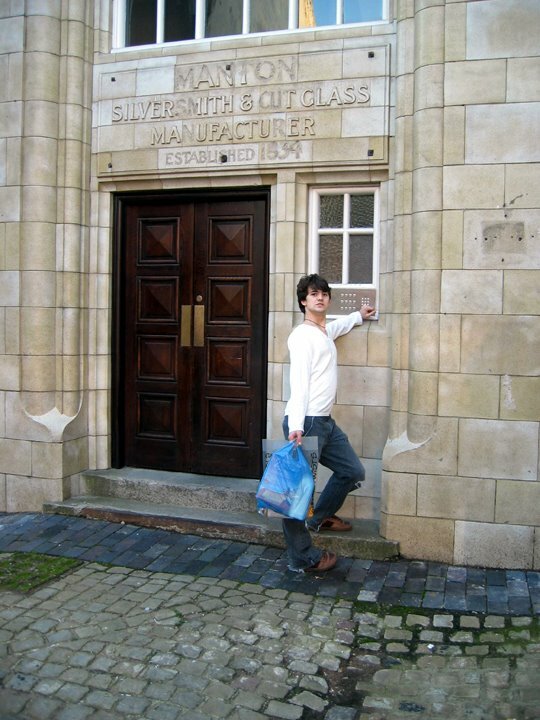 Most of the buildings were originally small factories for metal or glass. Mathias’ building was a silversmith and cut glass business. It was built in 1834 and re-done in 1914 or thereabout. The newest remodeling was only about a year ago. Thus, everything is quite modern inside though the ceilings are high, the windowpanes are of antique glass, and the flooring is all wide heart-of-pine or something similar. The apartment is on the third floor. It has two locked doors at the entry with individual, locked mailboxes between the two doors. The staircase isn’t steep. The railing is solid wood. Mathias has a nice, large bedroom with pumpkin orange walls and a built in closet with mirrored, sliding doors. The hallway leads past the bedroom into a large living area. The kitchen appliances and counters are along one side of this room. The bathroom has a full tub and shower just off the living area. The brown upholstered sofa is also a pullout bed. There is a shelving unit on another wall and a glass topped coffee table. He has two chairs and another table for eating, a small dishwasher, a combination washer/dryer, and a refrigerator. The windows each have blind. Definitely, this is a much nicer apartment than my first one, Steve’s first or second one, our first or second or third or fourth one together. In fact, it is nicer than anywhere we ever rented! Now it also has seven framed pictures, dinner and flatware, pots and pans, a cookbook, a can opener, a blender, and all the other things that make a rental property a proper home. My embroidery adventure started even before I left the country. My travel arrangements took me through the Philadelphia airport. I had to walk from one terminal to another, right past a fabulous installation by Carson Fox. I stopped dead in my tracks and then bee-lined for the large glass enclosure with her work. It was all made from human hair. The statement read: HAIR FILAGREE. The artwork of Carson Fox is inspired by the Victorian-era tradition of making jewelry and ornamental objects from human hair. In the 18th and 19th century, it was common to give loved ones a lock of hair as a remembrance and token of affection. Fox has since monumentalized this art form by creating large-scale curtain-like hair sculptures. Each curtain is elaborately woven of very thin wire wrapped with hair. The statement goes on with more details and with the artist’s educational background. Her work can be viewed on-line at her personal website: http://www.carsonfox.com/. She is represented by Claire Oliver Gallery in NYC. I knew that the trip was going to be a good experience. Seeing this unexpected pleasure was like a very good omen. In just a few hours I will be flying to Manchester, England through Philadelphia. I'm to take a train into Birmingham. I've packed two big suitcases full of kitchen items for Mathias' new "flat". I'm taking a few small, framed pictures too. I'm quite excited to see Mathias in his new home. 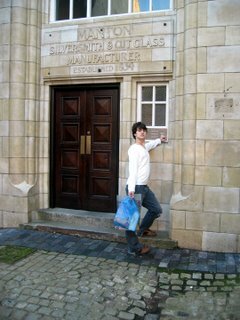 I'm excited to see the facilities where he rehearses and the building in which the company performs. I'm also excited that this coming weekend is the annual Stitching and Knitting trade show in Birmingham. The entire trip becomes a legal tax deduction as well as a chance to spend time with my son! On Friday I realized that all my hand-embroidery pieces had been recently completed. My evenings, in front of the television, have consisted of putting beads and embellishments on the articles for my archeology project. Basically, I’d forgotten to start anything else. This seems to happen every time I’m about ready to go out of town. I am facing uninterrupted time with no embroidery plan. I managed to get out of Mouse House by 3 in the afternoon. I knew I had to figure out what stitching could be done during the car ride to and from Atlanta as well as for the trip to England. I went to the studio. Wim Roefs had hosted a private preview party for the Phil Garrett and Mary Gilkerson monotype show the night before. (I had gone to Camden for Fran Gardner’s opening instead.) Yet, on Friday afternoon there was a sort of electricity in the air at Vista Studios. Random conversations floated over the walls of the gallery. People were wandering in and out. Music was playing. Wim was getting food and wine ready for the public opening. Several artists were working. It wasn’t quiet. I felt panicked. I shut my door, which I rarely do. I just had to get something started for the trips. I looked in the corrugated box with the leftover heat transfer painted papers and heat-transfer crayons. Conveniently, there was at least two yards of white polyester. I flipped on the old iron, the one that really gets HOT. Soon color was being ironed onto the material. I took eight sheets of regular typing paper and quickly sketched architectural line drawings with the blue transfer crayon. Like a charm, the picture went on top of the colors. Within forty-five minutes, I had eight backgrounds ready to go. Eight new pieces in the “Elements of Architecture” series. I stapled two to stretcher bars. Then I was able to relax despite the subtle commotion just outside my door. Actually, by the time 5:15 rolled around, I was solidly at work. More miniature quilts took form. I continued with the gold leafing in the “bird” altered book. I painted some wooden thread spools. I listened to the increasing volume of gathering people. I caught snippets of talk. I heard both familiar and foreign voices. Steve wasn’t coming until nearly 8 PM. By 7 PM, I slipped out of my studio with the eight backgrounds. I went home and changed clothes. I returned to enjoy the show. Shortly thereafter, Steve joined me. We looked at the monotypes. We congratulated Patti Brady on her fellowship award. We admired the strong craftsmanship of the chine collé. We both agreed that Mary Gilkerson’s work has never been stronger. We drank a glass of wine. Later, we had dinner at home. Alex had been to the Dreher High School football game. Yesterday, Saturday, we all got up and drove to Atlanta for the Décor art and framing trade show. I started one of the hand-stitching pieces for which I’d made a background and drawing. The trade show was quite smaller than in past years. Steve and I both have such fond memories of the annual framing trade show. We’ve likened it to “Pandora’s Box”, but these days are long since gone. Now, idle moulding representatives yawn and try to stay awake between casual browsers. The aisles are never crowded. Many booths are empty. There is a feeling of overall desperateness. Steve and I are so glad we downsized Mouse House when we did. We could look at the selections, the merchandise, the sales, and never really have a care in the world. It seems that this “cheap” business simply buys discontinued merchandise including all the Aaron Ashley Audubon prints. Aaron Ashley was bought by a larger company. 75% of its prints were discontinued. Steve and I found dozens of the images, all at $5. Yet, there weren’t any Long-billed Curlews (with the Charleston city view in the background) or any Carolina Parakeets or Snowy Egrets or Blue Herons. I asked about these popular images. The owner had ALL of them back in his warehouse. Now, we’ve got a source for the images we thought were gone forever. This alone was worth the drive to Atlanta! We got a real deal on the fifty metal frames we needed for the Carolina First Bank job. In fact, it was an amazing deal, almost a “steal”. Steve and I shook our heads at such an opportunity. At the same time, we shook our heads at the plight of our industry. The economy is terrible. The arts are suffering. As a result, we got more of a bargain than we had dared hoped. We looked at moulding, bought some, browse through art, and finally left. We went to a nice microbrewery for a very late lunch/early dinner. Then, we found our hotel, the Renaissance. We had to drive past the Fox Theater. Steve told Alex all about the premier of “Gone With the Wind” that opened there. I saw the signs for the Broadway touring “Beauty and the Beast” production. After we checked into our 22nd floor room, we went out on to balcony. We could see the Fox Theater. Alex called to see if “Beauty and the Beast” was playing that night. It was. Tickets were available. Steve and Alex walked over and bought a seat. I stitched. Alex was thrilled to see the show. Steve and I watched our Ohio State Buckeyes team in the game against Texas. We went into the game ranked as #1. Texas was #2. I couldn’t help but to think of last year’s match. Mathias and I took Philip Slocki and his mother to the OSU alumni hang-out in Bethesda, Maryland to see the game. I forgot they were from Texas. They won. But, this year we won. It was great. I stitched between instant re-plays. Football is a great thing to watch on television while stitching. There’s always a big scream to alert me that something worth seeing has happened. I can then look up and see the replay! This morning, we checked out of the hotel and headed back to Columbia. I stitched until we hit the city limits. Then, I went to the studio. I took this first project off the stretcher bars. I added a piece of navy chiffon as an overlay and a piece of felt as a backing. Within the hour, the piece was complete. I hope the other seven go as well! I finished painting all the wooden spools. I finished the gold leafing in the “bird” book. I stitched two vessels from black polyester cord that’s been in my studio since last year—a remnant from the 2005 Sumter Accessibility fiasco. I started collaging on ten small panels too. It was a fruitful day. Of all the wonderful pieces, this one "Arcane: Difficulty in Translation" was my favorite. Fran said is was also one of the two newest works in the exhibit. Karen White and Fran Gardner at their reception last night in the Fine Arts Center of Kershaw County. Last night Sharon Licata, Alex, and I drove to Camden, SC for the opening reception of "Language and Landscape: Art and Poetry of Fran Gardner and Karen White" in the Fine Arts Center of Kershaw County. I'd been looking forward to this for well over a week. I was also hoping to congratulate Fran as the SC Arts Commission's Fellowship winner in the category of crafts. This part didn't happen but the show was wonderful nonetheless. I've long admired Fran's work. I remember seeing it for the first time in the Governor's Mansion. This must have been five or six years ago. Somehow, Toni Elkins had suggested my name as an artist to create a one-of-a-kind Christmas ornament for the Governor's Christmas tree. It was the first year this was done. The "party" was hosted in the late afternoon by a local garden club. It seemed like an extension of the Junior League, but I was totally honored. There were only about six or seven artists asked. The idea was that six or seven more would be asked the following year. I really don't know if this was done again or not. The point is, I made an ornament. It was polyester velvets soldered, in the form of a palmetto tree. It had beads. I really don't remember what it looked like, but I went to the reception. I saw another incredible fiber ornament. It was all free-motion machined zig-zag stitched. I couldn't resist; I touched it, turned it over, and admired everything about it. I memorized the name: Fran Gardner Perry. In the spring I went to the Verner Awards with Connie Williams. Connie was on the SC Arts Commission's Board at the time. This was either my first time at the luncheon and art sale or my second time. I was a guest the first time. I was an artist the second time. Connie's daughter-in-law had already purchased Fran's work before I arrived. Had I come earlier, it would have been mine. It was a small piece on a wooden panel. Free-motion machine embroidery had been attached attractively with miniature nails. The tree-form was from Pritchard's Island. Fran went on the artist retreat the year before I went. I also learned that Fran was sister-in-law to then Governor Hodges. This was suppose to make a big impression on me. It didn't. I'd be much more inclined to say that former Governor Hodges has the rare distinction of being Fran's brother-in-law! Later, I saw a black-and-white image that included three machine embroidered tree patches on one wooden panel. The image appeared in one of the last "Artifacts", a printed newsletter from the SC Arts Commission. Cost reductions did away with this publication, but I remember that the caption to Fran's work mentioned a major, national award. By this point, just the name, "Fran Gardner Perry", had become an icon for me, a symbol of talent, originality, quality, and remarkable fiber abilities. Like Lee Malerich, Fran was one of my personal "embroidery goddesses." I was in awe and wanted to humbly meet her. About two years ago, I decided to write to Tom Ogburn, another artist who had lived in Columbia and been an aquaintance of mine. I own a one of Tom's works, a small wooden panel with a rhinosaurus on it. Kim Lemaster gave it to me for Christmas years ago. I wrote to Tom. I knew he was a close friend to Fran Gardner Perry. Later THAT VERY DAY, I went into my studio. Heidi Darr-Hope, Jeff Donovan, and a lady I didn't recognize were having a meeting about an upcoming joint show planned for the gallery. Unbelievably, this was Fran. I'd finally asked to meet her and was granted the opportunity even before my message had been read! FATE! Since then, Fran went through a nasty divorce. She dropped the "Perry", got remarried, but kept her maiden name. She is now FRAN GARDNER. I will go out of my way always to see her work, to watch the images evolve, and to support her in any way possible. Sometimes, my admiration for an artist dwindles over time and repeated exposure. This is not and will never be the case with Fran's work. It speaks to me. This was my favorite piece in the Kershaw County show. It was quite difficult to select a favorite because each is uniquely wonderful. Fran's transfers are mysterious, well done, and set my mind spinning with all their possible references. The stitchery is fine. The compositions are strong. When looking at one of Fran's pieces, I seem to be mentally transported into a crowded room of interesting people deep in multiple conversations. My mind cannot make out the languages or any one topic but my eyes seem to focus on the color, shape and suggestion of the visual art. The transferred drawing become alive. I am happily alone in a crowd. I am aware that no two people will look at the image alike. I am aware of beauty and an entire range of emotions. This is an experience that can never grow old. I have to admit, I didn't look at Karen's collages with her poetry superimposed upon them. I liked the poems she read, however. Karen and Fran have traveled together and used these trips as inspiration for their separate work. They've shown together several times. Past journeys have been to New Mexico, Maine, New Brunswick, Nove Scotia, and to Europe. I guess I'll end this long post where I started, the SC Arts Commission's Fellowships. The awards were announce on Wednesday. Fran has applied for thirteen years. Last year, we both received letters stating that the fellowship in the category of crafts was not going to be awarded because only four artists had applied. The board had decided that five were required, though nowhere on the website or application had this been written. Fran and I wrote letters. We argued that the quality of work, not the quantity of applicants, be considered. I wrote to each commissioner. Fran wrote and made telephone calls to various staff people. We both informed Jeffrey Day of The State newspaper. We got the issue on last December's board agenda. I went to the meeting. I learned some disturbing facts. As a result, there was a survey and a conference call. Basically, Fran and I felt like we'd opened a can of worms. Neither of us have any regrets about doing this. It was the right thing to do. Too many artists complain about the fellowship. The argument most often heard is that the award is now just $2500. Once it had been $7500, then $5000, then $2500, and finally $2000. This year it was up to $2500. My argument back to artists with this complaint was simple: We've all PAID to enter juried shows with prize funds totally less than $2500. It costs nothing to enter this! Anyway, Fran did not get the fellowship again. She says that she's done applying. I hope not. But of us, however, wonder whether being "trouble-makers" was held against us. Artists are always complaining that the jurors are just out-of-state friends of the Arts Commission's staff. Basically, if you aren't on Harriett Green's list of "favorites", you don't stand a chance. There's plenty to complain about her influence; but, I just don't buy it. Sure, the jurors likely know our staff people but I can't see anyone risking their jobs and reputations over an award like this! I looked up the jurors' backgrounds. There was a craft artist, functional clay; an administrator with a studio background in metals and jewelry; and a visual artist with a background in glass currently working in sculptural fibers. Sure, one also teaches and is married to another academic artist. Sure, both artist seem to have ties to the Alabama Arts Commission. Honestly though, it appears like a well-rounded group of qualified people. I also like the receiptants too. Peter Lenzo of Columbia won in the category of crafts. He works in clay. The alternate, whose name slips my mind just now, also works in clay. In Visual Arts: PATTY BRADY won and Janet Orselli was the alternate. I just wrote about Patty two days or so ago. I like her work, admire her knowledge, and think highly of her personality too! What can I say? I guess, as pathetic as I am--even a trouble-maker--I'll apply again! The deadline is October 1! I can never seem to attach photographs the first (or second or third) time while I'm writing a message. 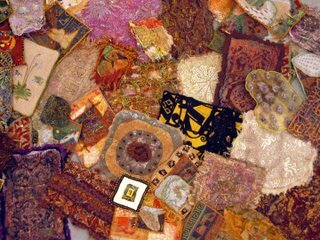 So, here's the photo of the quilt for Mathias and the photos of the first forty textile pieces for the Archeology Project. I actually have eight more textile pieces that are in the process of having beads and hand-stitched applied to them. The textiles are "easy" and FUN. The paper pieces are too. Actually, everything about this project is wonderful. I really am excavating "relics" from an imaginary culture, one in my mind. I am digging into my own past and fashioning a story of deep possiblities and wonderful mystery. I am making art that speaks of yesterday, today, and tomorrow--just as archeology does. History is never static; it is always being reinvented and retold accoring to whatever current insights the present day is hohlding dear! I love Labor Day Weekend. I love any three-day weekend or even a good two-day weekend completely spent within the sacred walls of my studio. Sure, I did get out a bit. I enjoyed leisure breakfasts over crossword puzzles and a couple hours at Nickelodeon Theater seeing “Who Killed the Electric Car?”, which was fantastic film. Yet, most of my attentions were on my archeology project. I am deep into the work and loving every second of it. The project has taken on a life of its own. It has invaded Mouse House, my every waking thought, and all my future plans. I am totally and happily obsessed. In fact, I decided that I ought to “excavate” all my older pieces. I haven’t a single work of art created in the twentieth century since I only began producing in the year 2000. That was six full years ago! A lifetime. I have one piece called Olympia. I called it that after Olympia Dowd, an amazingly beautiful dancer on her way to Kirov during the summer that Mathias was deciding between the National Ballet School of Canada and the Kirov. Olympia was breath-taking to look at and even more stunning when she danced. One could not help but to gaze upon her. I’ve frequently wondered where she dances now. Still, I stitched this piece so long ago that it wasn’t even in my inventory. Too much has happened since then. I’ve gotten much, much better. I was just tired of looking at older pieces. So, I took down over fifty. Steve gutted them. I adjusted (or added) the pieces in the inventory. Most had their prices lowered. Alex did the shrink-wrapping. Steve fitted several of the frames with mirrors. I will put antique botanicals or other images into the rest of the old frames. It was a cleansing project and also one that added to the stash of growing “relics” for the archeology project. I also rummaged through a container in my studio and found four old passports. Two were mine. God, did I look younger! Of course, I WAS younger. One had been Steve’s and the other had been Alex’s first passport. The stamps, covers, and even the photos will be worked into art. I also found a quilt. The quilt brought back a rush of memories. It was almost complete. More than half of it had been machine stitched together. It survived our house fire. It was still incomplete. 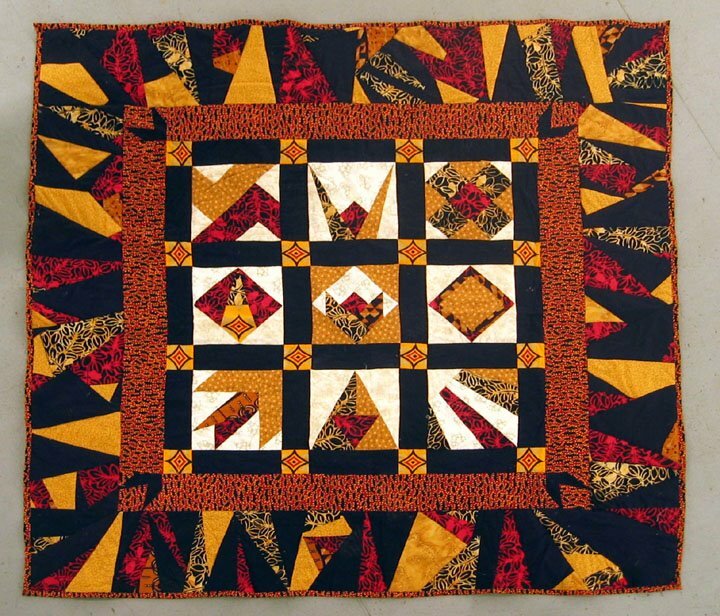 It reminded me why I’ll never be a traditional quilter. I had started quilting by paper-piecing but even when I started this quilt I’d given up on the paper. 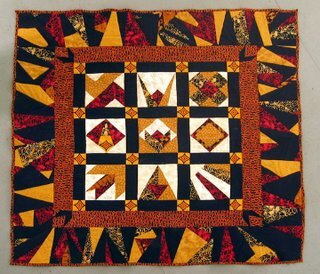 I had made nine “blocks” and put in a border sash, but it was the random “crazy-quilt” style, one foot wide edge that I had enjoyed making. I forced myself to pin it together with the finest cotton batting. I forced myself to “stitch in a ditch” most of the quilt. I knew that it wasn’t quite flat and the angles weren’t perfect. I couldn’t forced myself into that expected level of perfection. Finally, I just couldn’t force myself to work when I already knew the outcome, the pattern, the result. I quit. Yet, Mathias wrote to us about the red sheets he purchased for his apartment. It was the only color available in double-bed size at the flea market. This African print inspired quilt would love fine with red sheets even though, of course, it is too small and too square for the bed. I decided to finish it. It only took a couple of hours. Archeology is a good thing when it forces you to finish a project from your own “dark ages”! Although I accomplished this quilting, it was really all my “relics” I loved stitching this weekend. Then, it occurred to me, that these were all quilts. Almost every one has the required three layers! 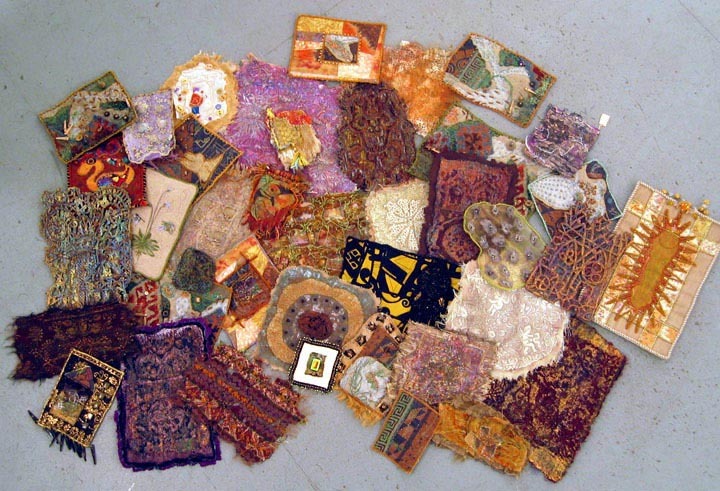 These are, in fact, miniature ART quilts. I’m producing them like mad. Nothing is being FORCED. It just flows out of me. The unconventional is evidently just ME! There! I’ve said it. I’ve put my goals into writing. It is a large order but even as I say the numbers I’d like twice as many! Time in the studio is all that is required! It's taken some time, not really much, but SOME TIME to clease myself from Ballet Talk for Dancers, an on-line forum for people interested in ballet. Basically, many of the "threads" are maintained by parents of wannabe dancers. They complain, cheer one another, boast about their kids, and pose questions from a group of moderators. These well meaning moderators are often ballet moms trying to find their place in the ballet world. Others are second rate teachers and some are even elderly dancers evidently trying to reclaim a little of their former "glory days" by appearing knowledgable and worldly to a cyber community. I got caught up in it for awhile, but briefly, and really didn't have too much trouble finding my way out again. I am indebted to Ballet Talk for Dancers in many ways. I found so many supportive readers, all kind souls who helped get me through the difficulties of Jackson and the trials of Varna. I was introduced to too many really super people through private messaging. My world has grown. I am truly grateful, but I'm not going to subject myself to the chastizing tones of people trying to protect my identity (or the identity of my dancer, Mathias). I'm fully aware that the Internet is PUBLIC. I embrace posting with my own name and encourage people to respond directly. I reaped much from my association with this group. I'll happily respond to any from this group, but I can't risk my sanity by trying to fit in again. I don't fit in. I can't. I'm grateful but must move on. I'll report ballet, as I see it and feel it and experience it, but HERE on my blog--not on their sorority-styled Internet site. Anyway, I recently cleared our my "In Box", "Sent", and "Saved Box"--or whatever they called these files (I'm a quick typist but a computer newbie!) I found one message sent to me from a lady who'd read my blog. She told me about her amazing mother, another fiber artist. Yesterday, I googled the mother's name: PENNY SISTO at www.pennysisto.com. OH MY GOD! What a talent! How totally inspirational. The daughter wrote to me that this amazing stitcher, a grandmother several times over, took up ballet a few years back and is now on pointe! I, however, couldn't quite get past her slave quilt series, her artist's statement, and the power of each quilt. 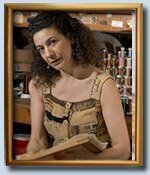 Penny Sisto is a lady who knows how to express herself with a needle and thread. She also knows how to deal with ballet. She took up dance herself. She does not live through her granddaugher. She has her own place, her own talent, her won vision, and her own agenda. She is a fiber artist of great acclaim. She reminded me most remarkably of my own, potential future. I went to the studio yesterday and again today with a renewed sense of utter passion. I was productive, creative, and worked tiredlessly. The results can be touched and enjoyed. My mind is engaged and setting lofty goals. Thank you PENNY SISTO. Thank you, to her kind daughter for sharing this remarkable work, a live's journery in fibers.